Jonathan and I have been looking forward to trying a full dim sum meal for some time now, as we love the small selection that can be found in certain restaurants in Florida. We've been twice since living in California. Andy and Jim, from the ELDP program, and Jim's girlfriend Vivien invited us to a dim sum lunch in downtown Mountain View the first time, and we went with just Andy the second time. Both times we went to Fu Lam Mum, which is on the north side of downtown. The place is two stories, but uses a gigantic atrium with only a handful of tables upstairs, when it might have been smarter to have a smaller atrium and more upstairs seating. Servers bring around carts with covered baskets and plates of food. This ranges from chicken feet to egg custard tarts to pork dumplings. There are also pork-filled pastries, rice paper-covered shrimp, pork-rice-mushrooms in leaves, and a variety of other things. You just let the servers know what to put on your table (which has a big lazy susan), and then you share the dishes. The servers mark on your receipt what you got, and then it is tallied up later to get your total bill. The difficulty: the servers don't speak English, and the dishes aren't labeled. So if you're not sure, you take a gamble. Luckily, Andy could communicate with the servers, so we were set. We loved pretty much everything we tried, especially the shrimp dim sums (and I'm not sure of the pluralization, so feel free to correct me). I didn't care for the leaf-filled option or the sweet pastry with pork, but we're definitely dim sum fans in general and can't wait to try more. The Chinese broccoli is also worth noting... I thought it was bitter, JB thought it was sweet. It looks nothing like regular broccoli except that it is green. 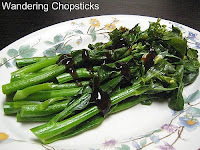 However, it has the stem of asparagus and leaves like spinach. I included a stock internet photo, the only difference from ours being that the oyster sauce was served on the side for ours, not drizzled across (which was a good thing, since it was way too salty for my tastes). Something to beware: only three people out of five had tea with the meal (trip #1), but they charged us for five people. Since the table was set with cups at each place setting, I guess that's how they charge... but Andy and I didn't even turn our cups over so they would be usable. Perhaps it could have been argued, but we didn't bother, since we only caught it at the last minute. The second trip, none of us had tea so it was a simple solution.